Originally from Lubumbashi, in the Democratic Republic of Congo, the author he now lives in Graz, Austria. His debut novel Tram 83 won the Grand Prix du Premier Roman des SGDL and his style has been compared to Céline, and Hunter S. Thompson and even John Coltrane. 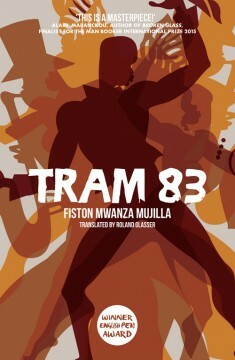 Tram 83 was translated by Roland Glasser from the original French and has been published by Jacaranda Books in the UK. 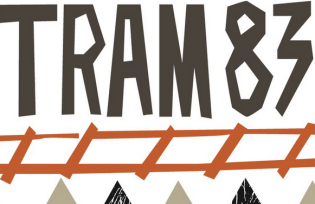 Tram 83 tells the tale of a poet called Lucien in an unspecified Congolese mining town, peopled with drunks, prostitutes and tourists – it is the soft underbelly of the DRC. The style reflects the violence, corruption and incoherence of a post-colonial nightmare with continuous refrains that at best are akin to Coltrane’s repeated riffs and at worst repetitive psychotic phrases that draw you in, disgust you and fascinate all at once. The poet Lucien is struggling to remain faithful to his conscience kicking out against the immorality and anarchy while his childhood friend Requiem has thrown himself headlong in the maelstrom of corruption and “anything goes” capitalism that is ripping the heart and soul out of the country. All the characters gravitate around Tram 83, a brothel, music hall, bar where the corrupt and estranged go to rest their wounds after a day of hustling. It is filled with singers, child prostitutes, miners, tourists and lost souls of every hue. It is an apt metaphor for a country raped and pillaged with little humanity left with which to redeem itself. The book is highly original and has caught the attention of critics and readers world-wide, fascinated by the emergence of a sophisticated and original voice from a country that seemed beyond description.